Upon re-reading my trumps-generated list of topics in the February 22 blog piece, the topic that stands out for me in this moment is Palliative Tarot. If someone who knew that they were in the process of dying called upon me in my capacity as tarot consultant, how would I handle it? What would I do? What might their session look like? If at all, how might taking the tarot into their experience be of value? I’m not sure that there would be anything to “handle”. What an honour to be invited into the presence of one of life’s significant rites of passage. What would I do? First, let me address what I would not do. I would not use the tarot for forecasting or prediction; we would already be aware of what’s on the way. I’d do my best to not impose my worldview about death and dying on the person. I would not launch into any “There, there, you’re going to a better place soon” speech. How insulting to talk about something that isn’t a certainty. So, what would I do? I would listen to the person, draw out what’s on hir mind and in hir heart about what they’re experiencing, ask them what brings them to the tarot at this time, jot down key points that seem fruitful to explore. If what emerges seems to want to be turned into a spread, I would co-create questions for that spread with the querent. I would give them time and space to look at decks so we could use the one(s) that are most appealing to them. The co-creation of questions and the selection of a deck(s) would provide an element of choice for the person, a couple of the few things about which they might feel they have any power to choose. Their session might look like a typical reading in which we hold a dialogue about the cards that turn up in the spread positions we generate. Or the session might be something more free-flowing; they might ask a question and pull a card and we’ll talk about it, then allow that to inspire another question for which we would draw a second card, and so on. Another way that the consultation could unfold would be to simply invite the dying person to look through the face-up tarot pack and sort the cards into piles that make sense to them according to colours, characters, moods, or actions depicted in the images. They would take their time creating these categories, then telling stories about each in turn, allowing both sweet and bitter memories to emerge. I would ask them honest, open-ended questions about each story and notice where that takes them then gently summarise what I hear in each tale so they would know that someone heard them. The process of sharing stories plus the ability to choose which cards belong together according to personal preference would again bring in an empowering sense of autonomy about something in their life. I might pull a card at random at the end of the consultation to respond to the question, “What does Name most need to hold in hir heart and mind about all of this?” to help tie together loose ends. Then again, the dying person’s needs may prescribe something that’s very different to what I’ve outlined here, so we’d carry out what the moment called for. All of this would be of value to the person by, as suggested above, giving hir a sense that s/he is still capable of making some choices, has autonomy in how s/he remembers and learns from hir own life stories, and has been witnessed in a respectful, sacred manner. This can be a rich, centring way to honour the deathing journey. I realise that this is only the tip of the iceberg of a potentially larger topic, so I invite readers of this blog piece to add ideas, questions, and techniques to the ones I’ve offered here. * Who am I in this lifetime? * What is the most appropriate way for me to be my authentic self? * What challenges and concerns have I experienced thus far, and what larger perspective can I gain from them? * How can I navigate the process of my becoming? * How can I offer the gift of my authentic self to our beloved world in useful ways in these times? Please join me for Cards for Life, a 90-minute teleseminar on Saturday, March 28 at 12:30 p.m. Eastern Time (9:30 a.m. Pacific / 5:30 p.m. U.K. & Ireland) to interact with your Life Cards, current Year Card, and decade-long Growth Cycle Card in ways that will open you to your true potential. Easy-to-follow handouts plus my compassionate verbal guidance will help you journey through the experience. By harvesting the themes of these timeless and exquisite symbols, you will gain certainty of purpose as well as ways to draw upon your own natural gifts, rhythms, and cycles to create optimal outcomes for your wild and precious life. To register for Cards for Life, email me your date of birth, then send a $25 payment to circleways.james@gmail.com through PayPal. A notice containing the number to call and code to use will be sent to you before the call along with a PDF of the handouts for the seminar. Afterward, you’ll receive a link to the recording of our time together so you can continue to deepen into the process. It will be an honour to dive for soul treasure with you on the 28th of March. P.S. You’ll need a tarot pack during the call. I’ll let you know ahead of time what cards are specific to you. P.P.S. Please tell your friends about this one-time empowering event. 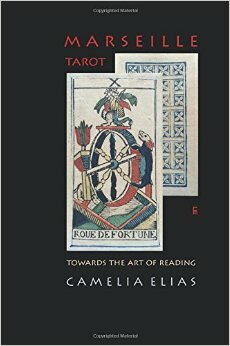 There’s a very good new book out written by Camelia Elias, a professional tarot reader and professor of American Studies who lives in Denmark. It’s called Marseille Tarot: Towards the Art of Reading, published by EyeCorner Press and available through Amazon. There are seven sections: A Question for a Story, The Trumps, The Court Cards and the Suits, The Reading, The Diviner, Carolus Zoya’s Time, and References. It’s illustrated with a one-of-a-kind deck, the Carolus Zoya version of the Tarot de Marseille, ca. 1790 – 1800, from the collection of K. Frank Jensen. “A Question for a Story” opens with a full-on reading for a woman who sees the reader using her/his cards in a café. We’re immediately drawn into the wonder of what can happen as a tarot session unfolds. Camelia Elias’s attitude in this chapter is a gust of fresh air, remaining open to both the counselling and fortune-telling schools of card consulting, not picking sides. She reminds us that when we read cards we are creating stories based on a dynamic sense of looking at what’s right in front of us. Another gorgeous idea in this chapter is that “The suggestions from the cards don’t always follow the rules of society, and that is a good thing…The cards ring the bell of poetic alternatives.” Liberating! “The Trumps” is the longest section because the author devotes an average of three pages to each of the 22 major cards. For every one, there is a picture, a succinct reflection based upon the card’s description, some possible keywords, the function of each trump character, health indicators (for health-related readings), and public roles or professions that can be indicated by the card when paired with another. Elias also provides real-life sample readings in which each card played a part, breathing life into the pasteboards and already giving us a glimpse into her mind as a practitioner of tarot. I like that she emphasises the urgency of asking a specific, open-ended question and paying heed to how each card’s figures embody a response to that question. It’s all very grounded. “The Court Cards and the Suits” focuses, as one might expect, on the 56 non-trump cards. Elias writes that reading the suits relies on common sense — What is a stick for? How does one employ a cup? What were swords designed to be use for? How do people use coins? The qualities and characters of colours, the quantity of emblems on a card, and the natural progression of one state to another — tension and release, increase and decrease, and expansion and contraction — also come into play. The author relies on these logical components in addition to the oral tradition of meanings she calls the cunning folk tradition. I appreciate that Camelia Elias tells us that it pays to be consistent with whatever system or method we choose. This chapter’s wisdom also includes going with tradition without necessarily buying the whole package and to treat the cards like a language rather than like a symbol. “The Diviner” takes us into Camelia Elias’s mind, offering us her views on the functions of reading cards and a series of helpful guidelines about how to do so as clearly and effectively as possible. We are counselled to stay close to the question and the cards rather than the person, not fall for a subject’s praise or criticism, be truthful, and not negotiate “meaning”. The reader is prompted to be clear, curious, and humble in order to get to the core of what querents need to know to help them “rise above the ‘impossible’.” In this chapter, I really felt the author’s ardent passion for reading cards. “Carolus Zoya’s Time” is a poem based on three cards — Empress, Sun, and Stars — from the deck with which the book is illustrated. Upon reading it, I perceived a sense of purpose that bridges the centuries. Beautiful. “References” is a comprehensive list of books, articles, and online resources including Camelia Elias’s own inspiring Taroflexions blog. From this inventory, you will find enough material to keep you happily reading for a very long time. I appreciate the directness, clarity, and certainty of purpose expressed in Marseille Tarot: Towards the Art of Reading. These qualities renew my hope that there is more to be said and carried out in this enjoyable and noble profession. I realised that I hadn’t posted any new blog pieces since January 26 because nothing was calling to me as a subject. So I thought, “Why not reflect on the Majors/Trumps of the tarot and use them to brainstorm blog topics.” As I did so, I realised that this brainstorming session would be today’s blog piece. So, based on various deck images and the concepts that often come to my mind about the Majors, my list is below. Brainstorming is about quantity rather than quality, so some of the ideas generated will be used for future posts and others will not. FOOL. The role of faith/belief in tarot, reiki, or any practice. Our calling as something marginalised or fringe or outcast. Optimism for these times. MAGICIAN. Tarot and magick. How to be discerning about any of these tools, fields, and practices. Doing readings, treatments, etc. at fairs or public venues. PRIESTESS. Intuition/psychism. Tarot, reiki, and/or circle as spiritual practice. The Oracle at Delphi’s admonition to “Know thyself”. EMPRESS. Tarot-based recipes. Creating and maintaining safe space for sessions. Bringing in and employing all the senses in consultations. EMPEROR. Tarot for business. Leadership. Real Men Use Tarot. HIEROPHANT. Teaching tarot, reiki, circle, and/or journalling. The philosophy behind what I do. Tributes to my various teachers/mentors. LOVER(S). Tarot for groups, pairs, or communities. Cooperative ventures (cross-referring with other practitioners?). What unifies the various components of my life and work. CHARIOT. Taking my work on the road. Tarot as navigation tool (as a sort of GPS for living). Warrior with a cause. JUSTICE. Maintaining balance/equilibrium. Equal return for effort put out — compensation for what we do as self-employed visionaries. Client as peer/equal. HERMIT. Tarot for meditation. Tarot and/or reiki for oneself. Knowledge/wisdom that I’ve gained thus far. WHEEL OF FORTUNE. Fate, destiny, and choice. The ripple effect of readings, treatments, and workshops. Tarot (or divination in general) for gambling/lotteries. STRENGTH. Tarot for animals. Reiki for animals. How to survive. The innate instinct to divine/Know. HANGED ONE. Surrendering to process. The sacrifice that must be offered before transformation or insight can take place. Different/opposite perspectives. DEATH. Tarot for grief. Tools and processes for endings/transitions. Palliative tarot, palliative reiki, or palliative circle process. TEMPERANCE. Tools for healing. Blending the tools I use with other tools/modalities (or not). Tarot-based cocktails/beverages. DEVIL. Boundaries for practitioners. Shadow work. Practitioner as “devil’s advocate”. TOWER. Quick sessions (pros and cons). What to do with broken up, used up, mangled up decks. Sustaining ourselves in times of disaster/surprise. STAR. Tarot and astrology. Tarot for prosperity. 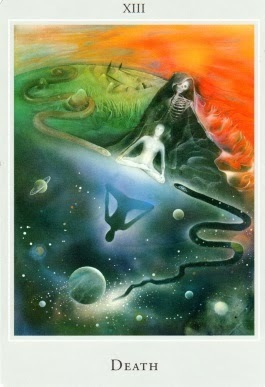 “Stars” of tarot, circle process, and/or reiki. MOON. Tarot as mirror or feedback tool. A lunar cycle spread/map. Night-time questions for reflection. SUN. A solar-based spread/map. Tarot for children/youth. Morning questions for reflection and revitalisation. JUDGEMENT. Evolutionary tarot. Tarot and music/sound. Tarot and/or circle for important rites of passage. WORLD. Tarot, circle, and/or reiki for the world, for the well-being of the planet. Moving or dancing the tarot images (benefits etc.). The power of choice. Transpersonal tarot, circle, or healing. Which of these, if any, call out to YOU? And what other topic ideas might the Trumps suggest?